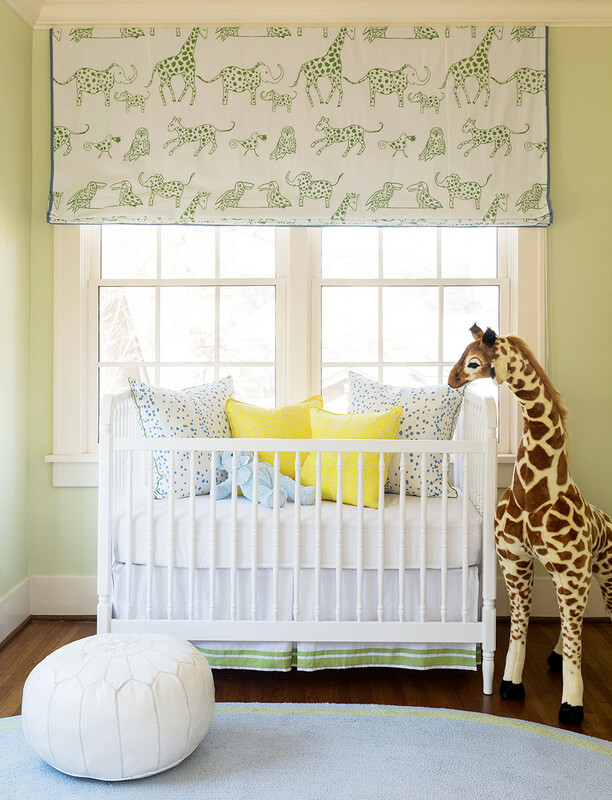 This simple nursery is filled with just the right amount of animal accents. Soft colors and patterns come together to create a space that a child can grow up in for several years. 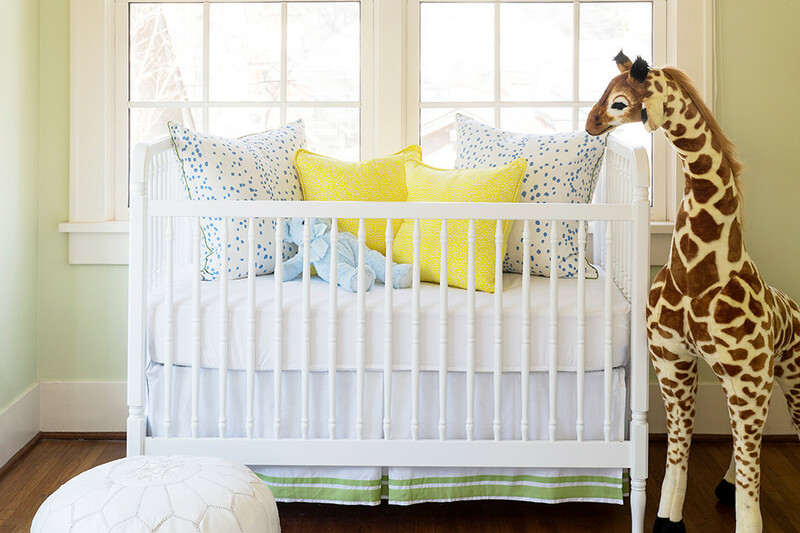 This simple nursery is filled with just the right amount of animal accents. Soft colors and patterns come together to create a space that a child can grow up in for several years. 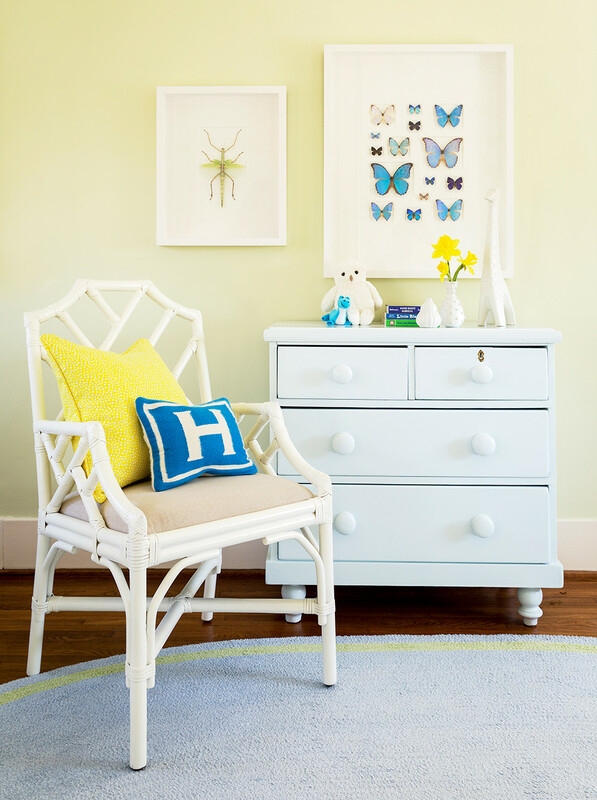 Interior Designer Susan Walsh at Bear Hill Interiors designed the space and shared with us her advice on color, the most important elements in a nursery and more. What’s your advice for choosing a wall color in a nursery? Part of it was dictated by the client and I knew that she liked blue, but we didn’t want to do a blue nursery because that would be really common ... I think we had already painted that room a soft green before she got pregnant so rather than repainting the room — the room was actually a home office before that — we used the blue and green. Gray is really trendy and it’s probably easier now to find in a lot of bedding or cribs. So sometimes that determines it — just what you can find. It also depends with what people start with — if it’s the crib or the bedding and then the room spins off of that. Blue accents, such as the dresser, brought a traditional baby boy feel to the nursery while maintaining a unique color scheme. What do you look for when choosing a statement pattern like the one in the curtains? When I found the fabric for the window treatments that was kind of the spinoff for everything else ... I think this pattern had enough negative space since it’s just the outline of the animals, so it’s not a lot of color, but yet it still has impact. I would definitely pick something that you really like and are going to like for a long time. There are definitely people out there that are not pattern people and if you don’t feel like you are you could still do a bold window covering with solid fabric and bold trim work and use patterns for … smaller pieces to have that punch. What are the key elements you want to include in a nursery? The changing tables are a thing that I don’t really know if you have to have them. I hear mothers say they kind of change the baby wherever they are. It might be on the bed or on the floor. I do think that if you have space, having a bed or a daybed in the room is key. If you don’t have space for that, then a really comfortable rocker. A lot of time mothers say that in the middle of the night feeding they will kick back in their rocker and nurse the baby and still catch some sleep. What I’ve noticed is that mothers get more practical the more kids they have. The first nursery you spend a lot of money on and the next nursery you get more practical. Definitely the crib is important and the rocker is important — those would be the two things that have the most longevity. What tips would you give for designing a gender-neutral nursery? Originally they had planned to also use that nursery for their next child. Their plan was if it was a girl we would switch out the blue for pink because pink and green work well together. We kind of had a game plan set for if the next child was a girl. I think what you have to do is pick more neutral colors or colors that would mix. You could do creams and ivories and beige … and then just lay in artwork once you know.